ACT has expertise in a wide range of advanced modeling techniques and also actively undertakes development of new modeling tools to address material and thermal phenomena in different applications. In addition to exceptionally strong heat pipe and thermal management heritage, the R&D team at ACT has rich history of modeling materials phenomenon from the nanoscale (several atoms) all the way up to micron level and macroscale (engineering length scale). The team has also developed several novel state-of-the art computational frameworks and tools to investigate thermo-mechanical behavior of materials, materials chemistry and multiphysics aspects of materials in combined thermal/fluid/electrical environments. These tools are developed using fundamental-level understanding of material physics and a spectrum of theoretical and computational approaches. 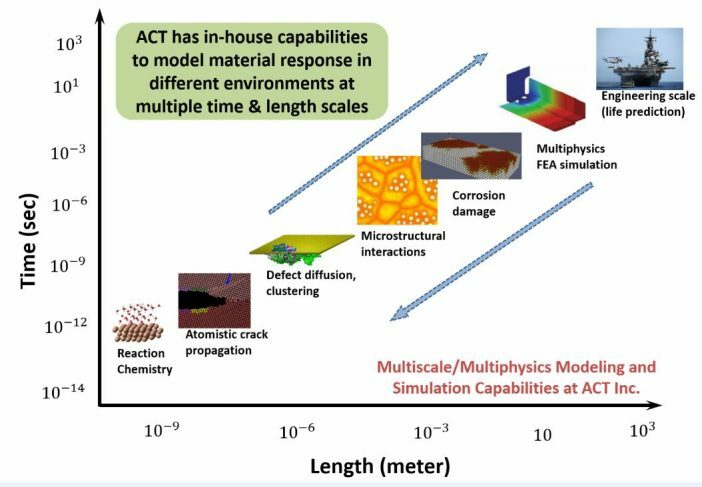 ACT has in-house capabilities to model complex fluid-thermal interactions as well as material behavior at the level of a few atoms to engineering scale components. The novel computational tools developed at ACT use high performance computing resources to solve complex, non-linear problems and provide a simulation paradigm to our customers (government and commercial) who are looking for fundamental understanding and accurate prediction capabilities. Such an understanding of materials from first principles and linking different time and length scales to yield accurate material behavior under different thermo-mechanical conditions will potentially lead to strategic shifts in materials development for new alloys, semiconductors, energetic materials, thermal insulators, PV cells and bio-sensors.